How do different musical instruments sound when they are played?All the different instruments play together at the end in an orchestral performance. Do they receive an encore? 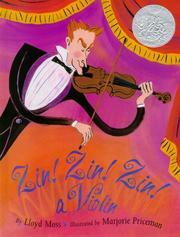 Moss, Lloyd, “Zin!Zin!Zin!A violin,” Children's Picture Book Database at Miami University, accessed April 18, 2019, https://dlp.lib.miamioh.edu/picturebook/items/show/9390.